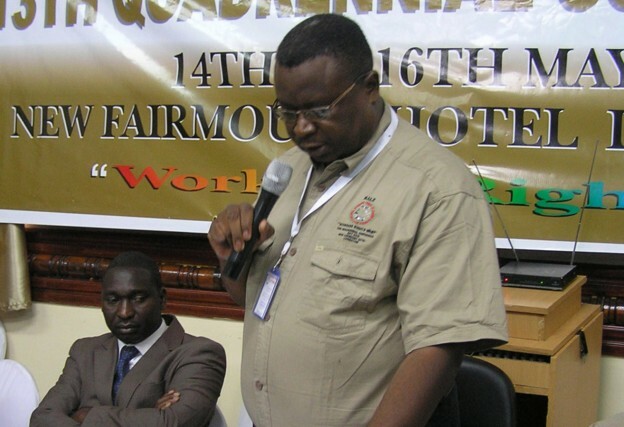 The Mineworkers Union of Zambia (MUZ) has called for calm among its general membership in view of the international statement by Mopani Copper Mines (MCM)’s parent company, Glencore, announcing its plans to suspend copper production in Zambia and Democratic Republic of Congo (DRC). MUZ president Nkole Chishimba said the union was actively engaging management at MCM with the view to finding solutions to the challenges affecting the company.Mr Chishimba who is also Zambia Congress of Trade Unions (ZCTU) president said the international statement by Glencore should not make MCM employees lose hope. He said in an interview in Kitwe yesterday that following the international statement by Glencore, the union held a series of meetings with MCM management aimed at consulting each other and finding solutions to the challenges. “We received a hit that Glencore was going to make an international statement and that statement has come but what we don’t know is how they are going to move at local level. “For us Glencore is a parent company with mining companies in various countries and all these have their peculiarities except what is the same is the copper prices,” he said. Mr Chishimba said with the competent team at MCM, he expected objectivity and progressive ideas aimed at salvaging the mining firm to be floated. This was not the first time that the country was encountering crisis in the mining sector as a similar situation during the global economic crunch occurred. “We have trust in Mopani team’s ability to manage things because to its full of competent people and so we can only urge our members to keep calm,” he said. Mr Chishimba, however, emphasized the need for the statement by Glencore to be managed with utmost care by MCM management so as not to allow it affect the morale of miners because ultimately, this could impact on production. Uncertainty surrounding the future of employees at MCM had serious potential to affect productivity. Meanwhile, Mr Chishimba expressed happiness with Government for having taken a progressive stance not to allow CNMC Luanshya Copper Mines to put Baluba Mine under care and maintenance and ultimately lay off over 1, 500 miners. “This is how sensitive Government should be and we are supporting that move because procedure has not been followed,” he said. Mr Chishimba said to his knowledge, procedure has not been adhered to as the unions were equally not informed about the move to place Baluba Mine under care and maintenance. What are you going to engage them about? Just run back to Chishimba Chimbwi. His threats may help you! MR Chishimba the reason Mopane will suspend mining in Zambia is not because of the world economic situation no,Its because of rapant Loadsheding that has affected production.So tell the truth how do you expect them to mine without power?Yes we know copper is not fetching much but if the cost production is reduced then there is business sense to keep producing ,but due to PF Government incompetence Mopane can not continue employing people who are producing boss. Hats off to Hon Kambwile. The insightful gentleman can “read” the economic climate prevailing in the country. Kudos to the Hon Minister….Despite his unpopularity on social media. That is a sign of success! You mean that he heard on either BBC, SKY or SABC 4 days ago? Logical business sense is you always look at how you can lower the cost of production. As long as Baluba has only 3MW of power to run the mines, the best alternative is to reduce one of the factors affecting the cost of productions….labour has to be cut down unfortunately. The Unions of these days are fake. This brother of Chimbwili is just getting fat when the members are being fire daily and he calls himself MUZ President? These unions used to be run by men not these modern homos that just want to be bribed. What is wrong with man? elected by PF? @ sido mark ,the reason why glencore is suspending production at mupani is nothing to do with load shadding nor economic stuation in zambia ,Glencore has its own challenges to do with its international debt burden .don’t blame every thing on loadshadding its not the first time we are having load shaddings in zambia lol. @ sido mark ,the reason why glencore is suspending production at mupani is nothing to do with load shadding nor economic stuation in zambia ,Glencore has its own challenges to do with its international debt burden .don’t blame every thing on loadshadding its not the first time we are having load shaddings in zambia . The simple fact is that the PF and their nonsense such as load shedding has made it too expensive to mine Copper in Zambia. Look at Canada and Chile. Have they stopped mining? NO. And their ore grades are only half of what we have here. This tells you that their mines are EFFICIENT! Even with the current Copper price the owners can still make a profit. Here in Zambia they cannot. 2016 is too long to wait. We need to kick out these clueless Pathetic Failures before they destroy Zambia completely.